While oar length is largely a matter of personal preference, we can help you wade through some of the specifications you should consider. Important specifications include boat type and size, gear and passenger load, water classification, skill, and your preferences as the oarsperson. Call us and we'll help you choose the oar that's right for you. You may want to consider oar extensions to make your overall package more flexible. Please note that oar length is measured with the blade on. 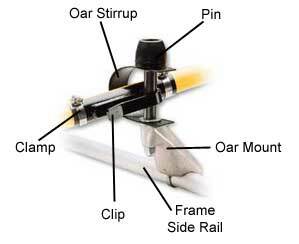 Oars slide easily up and back down the oarlock when pulling oar in to avoid obstacles. Easy to re-position mid-rapid if "popped out" of oarlock. Ability to feather blade (when not using oar rights). Holds oar and blade very securely. Hard to lose oar if oar stirrup is used. Oar can be completely released from oarlock if enough force is applied. Has more "play" which can be noisy. Oars can be difficult to pull in when approaching obstacles. 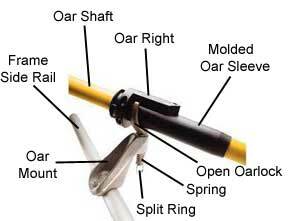 Hose clamps can damage oar shaft. Feathering blade is not possible.